General Tullius was an Imperial General of the Legion. Originally from Cyrodiil, he was appointed Military Governor of Skyrim and tasked with crushing the Stormcloak Rebellion. Tullius firmly believed that Ulfric Stormcloak and his rebellion were a threat to the Empire which had to be eradicated, and that Ulfric was nothing more than a power-hungry usurper. Amongst supporters of the Empire, Tullius was commonly regarded as their best hope for victory. A very taciturn and serious man, he initially held little interest in Nordic culture, viewing it as nonsense, but eventually he learned to respect it. 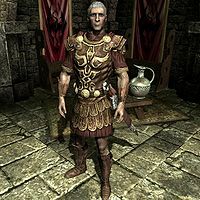 Tullius also despised the Thalmor, and believed the Stormcloak Rebellion was a mere interlude in the Empire's real conflict with the Aldmeri Dominion, even going so far as to remark that they almost made him want to throw in with the Stormcloaks. He believed the entire rebellion could be blamed on the Thalmor, who stirred it up to force the Empire to waste precious resources and soldiers. Esta página foi modificada pela última vez à(s) 23h07min de 17 de julho de 2015.